A protein family is a group of evolutionarily-related proteins. In many cases a protein family has a corresponding gene family, in which each gene encodes a corresponding protein with a 1:1 relationship. The term protein family should not be confused with family as it is used in taxonomy. Proteins in a family descend from a common ancestor (see homology) and typically have similar three-dimensional structures, functions, and significant sequence similarity. The most important of these is sequence similarity (usually amino acid sequence) since it is the strictest indicator of homology and therefore the clearest indicator of common ancestry. There is a fairly well developed framework for evaluating the significance of similarity between a group of sequences using sequence alignment methods. Proteins that do not share a common ancestor are very unlikely to show statistically significant sequence similarity, making sequence alignment a powerful tool for identifying the members of protein families. Families are sometimes grouped together into larger clades called superfamilies based on structural and mechanistic similarity, even if there is no identifiable sequence homology. Currently, over 60,000 protein families have been defined, although ambiguity in the definition of protein family leads different researchers to wildly varying numbers. As with many biological terms, the use of protein family is somewhat context dependent; it may indicate large groups of proteins with the lowest possible level of detectable sequence similarity, or very narrow groups of proteins with almost identical sequence, function, and three-dimensional structure, or any kind of group in-between. To distinguish between these situations, the term protein superfamily is often used for distantly related proteins whose relatedness is not detectable by sequence similarity, but only from shared structural features. Other terms such as protein class, group, clan and sub-family have been coined over the years, but all suffer similar ambiguities of usage. A common usage is that superfamilies (structural homology) contain families (sequence homology) which contain sub-families. Hence a superfamily, such as the PA clan of proteases, has far lower sequence conservation than one of the families it contains, the C04 family. It is unlikely that an exact definition will be agreed and to it is up to the reader to discern exactly how these terms are being used in a particular context. The concept of protein family was conceived at a time when very few protein structures or sequences were known; at that time, primarily small, single-domain proteins such as myoglobin, hemoglobin, and cytochrome c were structurally understood. Since that time, it was found that many proteins comprise multiple independent structural and functional units or domains. Due to evolutionary shuffling, different domains in a protein have evolved independently. This has led, in recent years, to a focus on families of protein domains. A number of online resources are devoted to identifying and cataloging such domains (see list of links at the end of this article). 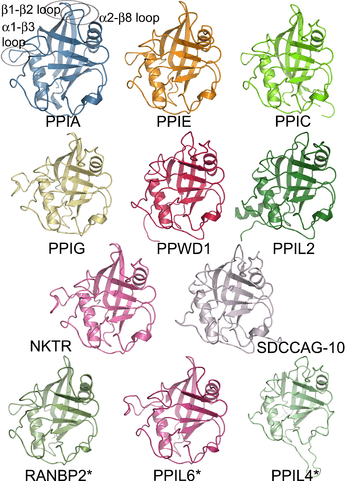 Regions of each protein have differing functional constraints (features critical to the structure and function of the protein). For example, the active site of an enzyme requires certain amino acid residues to be precisely oriented in three dimensions. On the other hand, a protein–protein binding interface may consist of a large surface with constraints on the hydrophobicity or polarity of the amino acid residues. Functionally constrained regions of proteins evolve more slowly than unconstrained regions such as surface loops, giving rise to discernible blocks of conserved sequence when the sequences of a protein family are compared (see multiple sequence alignment). These blocks are most commonly referred to as motifs, although many other terms are used (blocks, signatures, fingerprints, etc.). Again, a large number of online resources are devoted to identifying and cataloging protein motifs (see list at end of article). According to current consensus, protein families arise in two ways. Firstly, the separation of a parent species into two genetically isolated descendent species allows a gene/protein to independently accumulate variations (mutations) in these two lineages. This results in a family of orthologous proteins, usually with conserved sequence motifs. Secondly, a gene duplication may create a second copy of a gene (termed a paralog). Because the original gene is still able to perform its function, the duplicated gene is free to diverge and may acquire new functions (by random mutation). Certain gene/protein families, especially in eukaryotes, undergo extreme expansions and contractions in the course of evolution, sometimes in concert with whole genome duplications. This expansion and contraction of protein families is one of the salient features of genome evolution, but its importance and ramifications are currently unclear. 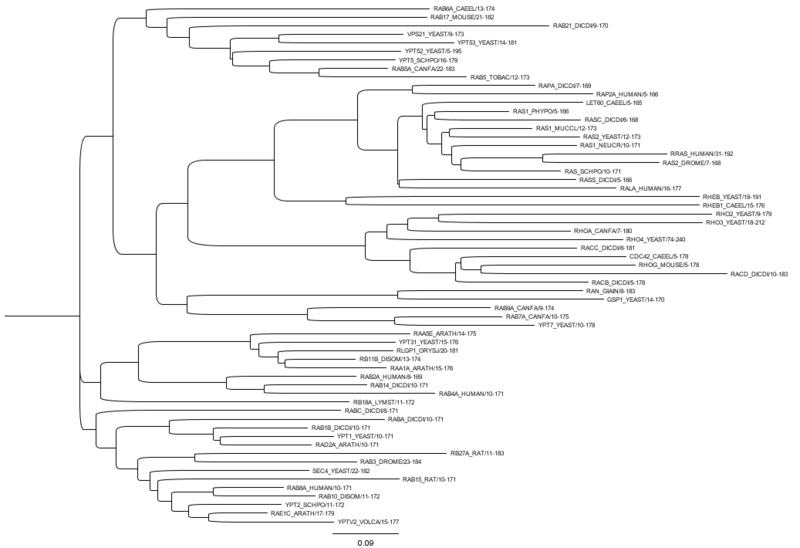 Phylogenetic tree of RAS superfamily. Tree was created using FigTree (Free online software). As the total number of sequenced proteins increases and interest expands in proteome analysis, there is an ongoing effort to organize proteins into families and to describe their component domains and motifs. Reliable identification of protein families is critical to phylogenetic analysis, functional annotation, and the exploration of diversity of protein function in a given phylogenetic branch. The Enzyme Function Initiative (EFI) is using protein families and superfamilies as the basis for development of a sequence/structure-based strategy for large scale functional assignment of enzymes of unknown function. The algorithmic means for establishing protein families on a large scale are based on a notion of similarity. Most of the time the only similarity we have access to is sequence similarity. ↑ Kunin, V.; Cases, I.; Enright, A. J.; De Lorenzo, V.; Ouzounis, C. A. (2003). "Myriads of protein families, and still counting". Genome Biology. 4 (2): 401. doi:10.1186/gb-2003-4-2-401. PMC 151299 . PMID 12620116. ↑ Dayhoff, M. O. (1974). "Computer analysis of protein sequences". Federation proceedings. 33 (12): 2314–2316. PMID 4435228. ↑ Dayhoff, M. O.; McLaughlin, P. J.; Barker, W. C.; Hunt, L. T. (1975). "Evolution of sequences within protein superfamilies". Die Naturwissenschaften. 62 (4): 154–161. Bibcode:1975NW.....62..154D. doi:10.1007/BF00608697. ↑ Dayhoff, M. O. (1976). "The origin and evolution of protein superfamilies". Federation proceedings. 35 (10): 2132–2138. PMID 181273. ↑ Gerlt, J. A.; Allen, K. N.; Almo, S. C.; Armstrong, R. N.; Babbitt, P. C.; Cronan, J. E.; Dunaway-Mariano, D.; Imker, H. J.; Jacobson, M. P.; Minor, W.; Poulter, C. D.; Raushel, F. M.; Sali, A.; Shoichet, B. K.; Sweedler, J. V. (2011). "The Enzyme Function Initiative". Biochemistry. 50 (46): 9950–9962. doi:10.1021/bi201312u. PMC 3238057 . PMID 21999478. ↑ Gandhimathi, A.; Nair, A. G.; Sowdhamini, R. (2011). "PASS2 version 4: An update to the database of structure-based sequence alignments of structural domain superfamilies". Nucleic Acids Research. 40 (Database issue): D531–D534. doi:10.1093/nar/gkr1096. PMC 3245109 . PMID 22123743. ↑ Emms DM, Kelly S. (Aug 2015). "OrthoFinder: solving fundamental biases in whole genome comparisons dramatically improves orthogroup inference accuracy". Genome Biology. 16 (157): 157. doi:10.1186/s13059-015-0721-2. PMC 4531804 . PMID 26243257.